Momentum swung back and forth like a pendulum between the Celtics and the Timberwolves during the fourth quarter of their matchup at Target Center Saturday night. It started on Boston’s side, with the C’s holding an 89-79 lead early in the final frame, but Minnesota seized control at the 10:16 mark, when it began a 10-0 burst over a 90-second span. From there, the momentum took a dramatic shift back in the Celtics’ direction, as they went on a 9-0 run of their own to take a 98-89 lead. But that pendulum swung right back toward the Wolves, who went on a 12-3 run, cutting their deficit down to two points with 3:31 remaining. By that point, Gordon Hayward had had enough of the back-and-forth nonsense, so he took the game into his own hands. 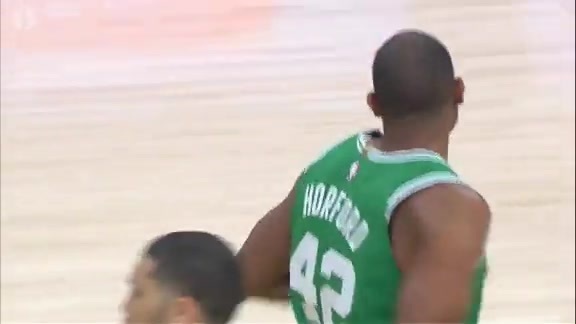 He led the Celtics on a 10-2 stretch over the next two minutes of action, knocking down a pair of jumpers while also getting to the line four times, where he knocked down all of his free throws. The last of those freebies put the Celtics back up by 10 with 1:23 remaining in the game. The Wolves attempted to respond, scoring four straight points of their own, but Hayward put an end to their comeback effort with a 3-point dagger at the 36-second mark, giving him 16 points in the quarter and 30 on the night. From there, the C’s cruised to a 118-109 win, completing a back-to-back sweep. If it had been a few weeks ago, Gordon Hayward would not have been playing on the second night of a back-to-back. However, with all of his post-injury restrictions lifted, he was able to let loose in Minnesota Saturday night, guiding the Celtics to their second win over a 24-hour span by putting forth the best all-around performance of his young Celtics career. Hayward followed up Friday night's 14-point, six rebound effort against the Cleveland Cavaliers with season highs of 30 points, nine rebounds and 8 assists against the Wolves. He also snagged a pair of steals and secured a plus-14 rating during 30 minutes of action at Target Center. The veteran wing saved up enough juice at the end to drop 16 points during the fourth quarter, including 11 of the Celtics' last 15 points. He did this all while showing zero signs of fatigue. 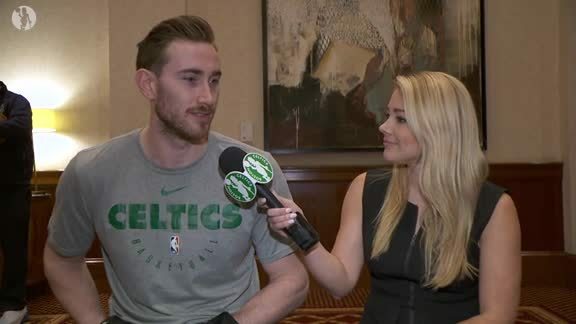 It was far and away Hayward’s best performance in a Celtics uniform, and the fact that it came on the back-end of a back-to-back made it all the more sweeter. Both teams' top scorers came off the bench – Gordon Hayward (30 points) and Derrick Rose (26 points). For Hayward, it was his first 30-point game since May 4, 2017. The Celtics dished out 30 assists on 40 made field goals. Robert Covington logged the game's only double-double with 17 points and 10 rebounds. Minnesota logged 50 points in the paint to Boston's 38. Kyrie Irving was the game's top facilitator, dishing out nine assists. The Celtics had a 13-3 advantage in fast-break points. Marcus Smart led the contest with four steals. The Celtics shot a perfect 21-of-21 from the free-throw line. It marked the 14th time in franchise history that Boston shot 100 percent from the line on at least 20 attempts. This has not been easy for him, and all he's done is grit his teeth and work hard. Brad Stevens on Gordon Hayward.